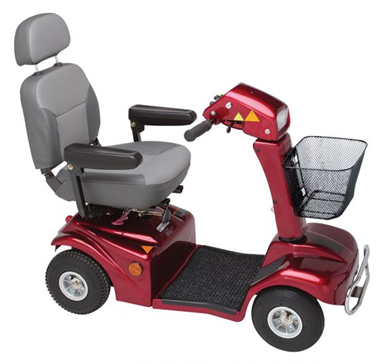 The Rascal 388 Deluxe is a mobility scooter that offers performance far above its size, and over and above many larger models. For a scooter with this much performance, it has extremely compact dimensions. At 21’’ wide, it is the narrowest width of any scooter in its class it is equally at home inside a busy supermarket as it is on the pavement. There is a comfortable Captain style seat, offering plenty of padding, folding armrests, and the ability to adjust the seat for legroom. The large pneumatic tyres offer impressive ground clearance.